I've been on a bit of a gym kick for the past year so there are parts of my body that are getting a workout that have never had to deal with being active before... One of them? My calves. Also my feet. UGH. I see a massage therapist every few weeks to help me work on the muscles and do a daily stretching routine, but any other supports are always welcome. 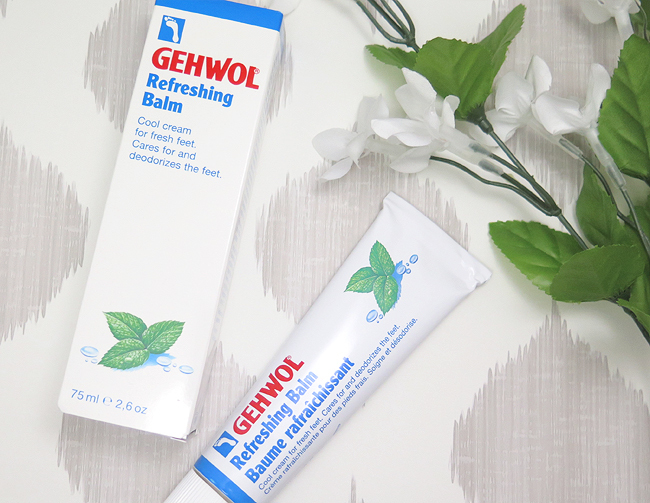 So you can imagine my joy when I got an offer to review one of the products in the Gehwol line - a refreshing balm to help with aches in feet and legs! *angels sing* Did it work as well as I had hoped? Check out below the cut to find out! Directions: Natural peppermint oil and menthol refresh tired, burning and aching feet and legs. It immediately soothes, cools and deodorizes your feet for that fresh feel that lasts. Protective ingredients regulate skin moisture and restore elasticity to hardened skin areas. Apply a thin film of Refreshing Balm and gently massage into skin. Absorbs rapidly and doesn't leave any greasy residue. So my first impression when I opened this was that I could really smell the menthol, but not in a way that set my allergies off (hooray!). 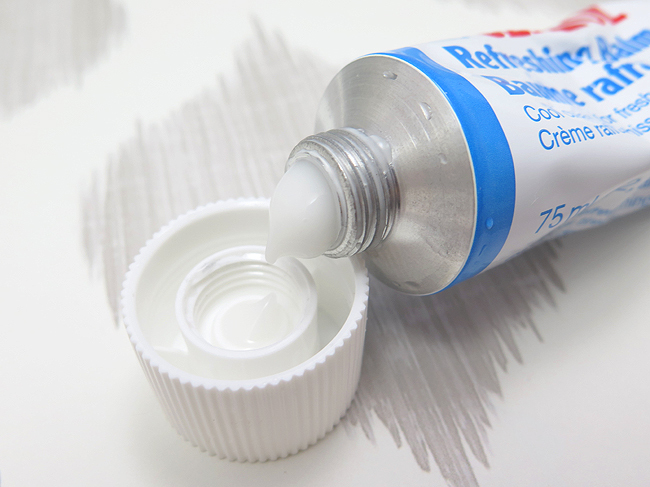 I was also a bit surprised with the fact it wasn't that thick of a cream but I think that was good because it rubbed in really easily and quickly and definitely didn't leave any residue. There was a very slight warmth but not as much as I am used to feeling with menthol-based products. Did I feel a difference when I applied it? In the tension in my legs, a bit. But on the skin of my feet? A lot! I think for the aching I will need to rub a bit more in or use it more regularly, but I definitely noticed an immediate difference in the rough skin on my feet (as I have left my feet way too long without a pedicure). I did one foot so I could compare the feeling of my "refreshed" foot vs my control sample (lol) and holy man was there a difference! Soft and noticeably smoother and less dry. I love using mint and menthol products for aches and pains as I find the smell really soothing and usually can feel a bit of warmth on the skin, so for those reasons I liked this product. But if you're not as big a fan of those scents and of the slight warmth this might not be the right product for you! If you're interested you can now pick up the Refreshing Balm and a bunch of other awesome Gehwol products at Nail Polish Canada which is great because yay supporting Canadian distributors! 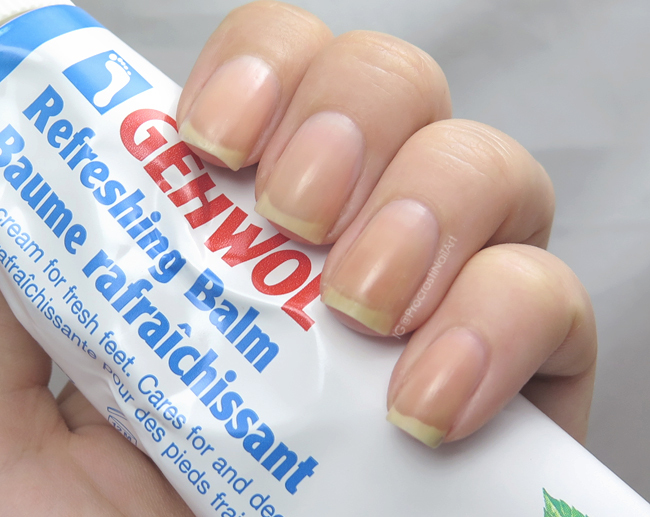 In general the Gehwol line is made of quality products with essential oils and natural ingredients, and though their products might look really medical or intimidating they actually carry quite a bit that is awesome to help with daily nail/manicure care (like their Med Nail Softener and their Med Protective Nail and Skin Cream). So they're definitely worth checking out, even if you aren't as in-need of balm for your calves as feet as I am! Have you tried any Gehwol products before? Do any of them tickle your interest? :) Let me know! Nice review on this balm. Its great to hear it worked in helping to soothe your aches. Never heard of this brand! However I do love mint and menthol scents! I will totally have to try this. I broke my ankle in February and am always looking for ways to make my stiff muscles looser now! I need this for my arms, as I always end up carrying the littles on one side.